Developed by Rudolf Steiner in 1919, Waldorf Education is based on an understanding of human development that addresses the needs of the growing child. Waldorf teachers strive to transform education into an art that educates the whole child—the heart and the hands, as well as the head. For the Waldorf student, music, dance, and theater, writing, literature, legends and myths are not simply subjects to be read about, ingested and tested. They are experienced. Through these experiences, the students cultivate a lifelong love of learning as well as the intellectual, emotional, physical and spiritual capacities to be individuals certain of their paths and to be of service to the world. Teachers in Waldorf schools are dedicated to generating an inner enthusiasm for learning within every child. They achieve this in a variety of ways. Even seemingly dry and academic subjects are presented in a pictorial and dynamic manner. This eliminates the need for competitive testing, academic placement, and behavioristic rewards to motivate learning. It allows motivation to arise from within and helps engender the capacity for joyful lifelong learning. The Waldorf curriculum is broad and comprehensive, structured to respond to the three developmental phases of childhood: from birth to approximately 6 or 7 years, from 7 to 14 years and from 14 to 18 years. Rudolf Steiner stressed to teachers that the best way to provide meaningful support for the child is to comprehend these phases fully and to bring “age appropriate” content to the children that nourishes healthy growth. Today, there are more than 900 Waldorf schools in 83 countries. 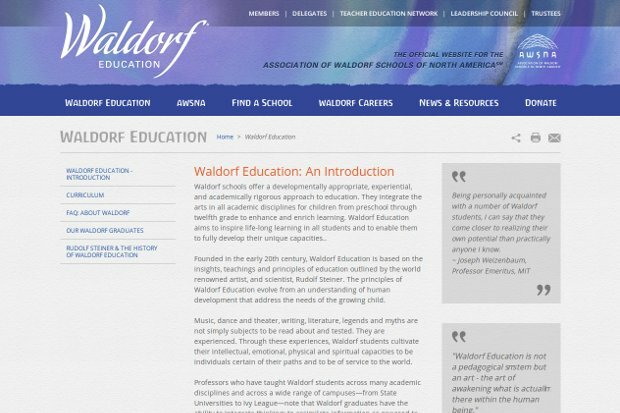 In North America Waldorf Education has been available since 1928, and there are now over 250 schools and 14 teacher training centers in some level of development. These schools exist in large cities and small towns, suburbs and rural enclaves. No two schools are identical; and each is administratively independent. Where is the room where I can read?